To Cite: Johari Daha F, Rasaneh S, Salehi Zahabi S. Preparation of 177Lu-Rituximab and Comparison with 131I-Rituximab Radiolabeled with Chloramine-T Method, J Clin Res Paramed Sci. Online ahead of Print ; 7(2):e87181. doi: 10.5812/jcrps.87181. Background: The main purpose of radioimmunotherapy is delivered lethal dose to the tumor cells which depends on the immunological and pharmacological of the antibody (Ab) property and the conjugated radionuclide characteristics. Objectives: The aim of this study is preparation of DOTA-Rituximab complex and radiolabeling with Lu-177 and comparison with the results of 131I-Rituximab radiolabed with Chloramine-T method that was obtained before. Methods: The number of chelator molecules (DOTA) attached to the DOTA-Rituximab complex was determined by Arsenazo III reagent. After radiolabeling with Lu -177, the stability in normal saline and the biodistribution in the healthy mice was evaluated. 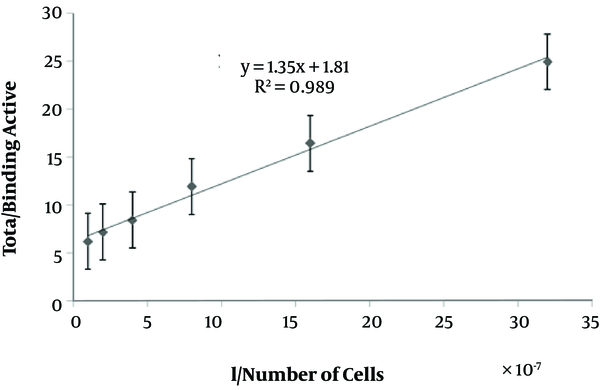 The Immunoreactivity of Ab was checked on Raji cell lines and the results were compared with 131I-Rituximab. Results: Each 300 μg of antibody was labeled with 6 mCi Lu-177. After 48 hours, 82% of the radiolabeled antibody was stable and about 18% of the radiotracer was in the blood. The immunoreactivity was calculated 85% ± 2%. Conclusions: The results showed that radiolabeling with Lu-177 was done with higher yield than iodine-131 and the produced radiopharmacy has more stability and immunoreactivity. The biodistribution results were acceptable in both radiopharmacy. Radioimmunotherapy (RIT) is a targeted therapy with antibodies to concentrate therapeutic radioactive substances in tumors and cancer cells, by decreasing the amount of drug the side effects will be reduced (1). The main goal of RIT is transferring a lethal dose of radiation to tumor cells. Therapeutic efficiency differs based on immunological of antibody, tumor penetration, antibody affinity, and the radioactive properties of the conjugated radionuclide. Generally, it takes several days for antibodies to penetrate solid tumors (2). In RIT, the half-life must be long enough. A 3 - 8-day half-life is appropriate for this purpose. (1). Non-Hodgkin lymphoma (NHL) is a cancer affecting lymphocytes. NHL is classified into various types: Fast-growing and slow-growing (3). NHL is an ideal case for treatment with radiopharmaceuticals (4). Rituximab is a monoclonal chimeric antibody against antigen CD20 for treating NHL or chronic lymphocytic leukemia (5). NHL has a higher sensitivity to medium-dose-rate compared to high-dose-rate radiation, and normal tissues tolerate LDR radiation effects better than HDR ones (4). Medium-energy beta-emmiters such as 131I(0/5 Mev) and 177Lu(0/8 Mev) up to 1 mm can penetrate tumor tissue and kill hundreds of tumor cells (4). In the present study, rituximab was labeled with 131I and 177Lu which are two medium-energy beta-radiators, and results of the radiolabeling efficiency, stability, immunoreactivity, and biological distribution were compared. The anti-CD20 antibody was purchased from Sobhan Oncology in the form of vials containing 100 mg in 10 mL, and purified by using borate buffer (pH = 8 - 8.5) and 13000-Dalton dialysis tubes. The Lu-177 radionuclide was prepared by 176LuCl3 bombardment under neutron bombardment and the (n, γ) reaction in Tehran Research Reactor (TRR) at the flux of 2.6 × 1013 n.Cm-2.S-1 for 14 days and dissolving it in 1M HCl. The DOTA-NHS chelator was purchased from Macrocyclice. Other chemicals were used without further purification. One mg of DOTA-NHS was added to 5 mg of Ritiximab in borate buffer (pH = 8-8.5), and was shaked for 24 hours at 2°C - 8°C. It will be purified by using 0.25 M Ammonium Acetate Buffer in 13KD dialysis tubes for 24 hours at 2°C - 8°C (6, 7). For determining the number of DOTA conjugated to the antibody, 50 mL of the DOTA-Ab complex was added to 950 μL of the Arsenazo reagent and incubated for 20 min at room temperature in a dark place. The UV absorbance was determined at 590 nm against the Arsenazo as standard solution, then the number of conjugated DOTA chelators per mole of antibody was calculated (8, 9). For radiolabeling 300 μg of the DOTA-Ab complex was incubated with 6 mCi of 177LuCl3 in 0.1 N HCl for 3 hours at 37°C. For purification of radiolabeled antibody, Sephadex G-25 column and for measuring the immunoreactivity of fractions NaI well type gamma counter device was utilized. The stability of 177Lu-Rituximab was determined by paper chromatography on Whatman 3MM and normal saline as solvent at the intervals of 1, 3, 8, 24, and 48 hours. 177Lu-Rituximab was diluted in PBS (1 mCi/mL of phosphate buffer saline) in a refrigerator at 4°C (10). 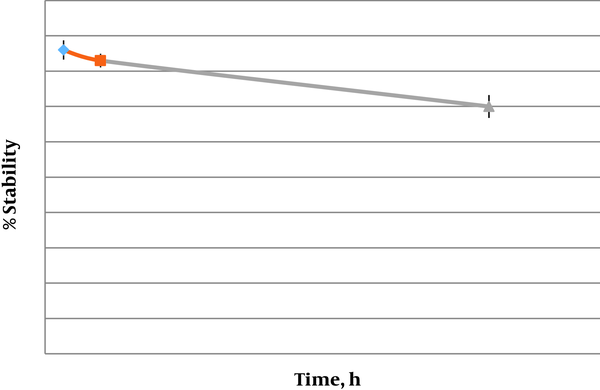 Biodistribution was examined in normal male mice weighing approximately 25 - 32 g. they were kept in standard separate cages with a 12:12 dark/light cycle at 23°C ± 3°C. After transfer from Pasteur Institute, the animals were kept at the Animal House of the laboratory. The mice had free access to food and water and were fed with mice and rat food. After one week of treatment, the mice were used for tests. The test was performed on series of three mice. 100 μL of 177Lu-Rituxiamb (1 mCi) was administered through vein tail. The animals were sacrificed under CO2 atmosphere 4, 24, and 48 hours post injection and The percentage of the dose per gram of tissue was calculated (%ID/g) (11). The immunoreactivity was assessed using Lindmo method (12). 6 × 107 Raji cells in 1 mL of cell culture medium in 2 mL microtubes were poured in another five tubes (each tube contained half the number of cells in the previous one) and the 177Lu-rituximab was added. After 2 hours they were centrifuged and washed multiple times so that only the cell-conjugated activity would remain. The curve of cell-conjugated activity against 1/ number of cells was drawn. The slope of this curve indicates the percentage of intact antibody after radiolabeling process. Each measurement was done in triplicate, and the mean was reported. On average, 3.5 DOTA were conjugated to each antibody molecule. Labeling was performed with 6 mCi of 177LuCl3 per 300 μg of antibody, and the radiolabeling yield was 92%. After 48 hours at 4°C 82% of 177Lu- Rituximab was stable (Figure 1). 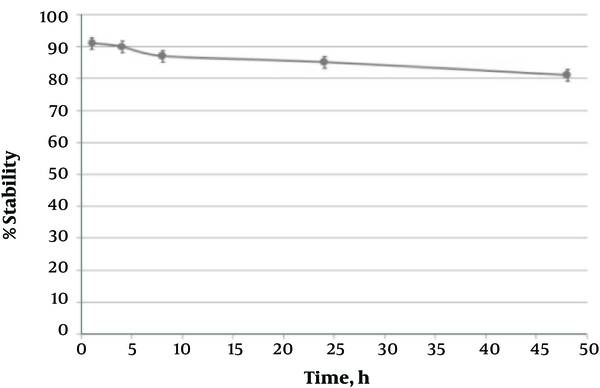 Results of biodistribution (Figure 2) indicated the acceptable stability of 177Lu- Rituximab Significant amounts of it after 48 hours remained in blood pool of normal mice. The immunoreactivity test (Figure 3) shows 85% ± 3% of radiolabelled Antibodies after labeling with Lu-177 were intact and they ca bind to their receptors on the surface of B lymphocytes (8). For radiolabeling chloramine-T method was applied. The efficiency was 86% (Figure 4). The stability was examined at 1, 3, 24 after labeling by paper chromatography after 24 hours 70% of 131I-Rituximab was stable (Figure 5). The %ID/g of 131I-Rituximab showed acceptable amount of it 48 hours post injection in blood pool (Figure 6). The trace amount of activity in thyroid approved the stability of radiopharmaceutical. Radiolabeled antibodies are appropriate candidates for targeted therapies. Precise antibody, radionuclide and chelator selection are very important (1-4). Macrocyclic chelators such as DOTA provide stable binding to the radiometal. In this study 3.53.5 DOTA molecules were conjugated to each antibody (in previous studies have reported 4 molecules). However, the conjugating of 10 or more DOTA, reduces the immunoreactivity by 50% (8, 14, 15). 177Lu is a suitable radionuclide for RIT because of low-energy beta emition and gamma ray (113 KeV 6.5%; 208KeV 11%) for scintigraphy. As the target/non-target rate is higher in low-energy beta-radiating radionuclides than high-energy ones, 177Lu is preferred for scintigraphy in NHL patients (2, 6, 7). Radiolabeling was performed with 6 mCi 177LuCl3 and 300 μg of antibody with the radiolabeling efficiency 92%. The 177Lu-Rituximab was 82% stable 48 post labeling. The constant amount of radiopharmaceutical in bone confirmed its stability (7). For in vivo targeting evaluation, immunoreactivity assessment was performed by Lindmo method (12). The result shows 85% ± 3% radiolabeled antibody was intact. 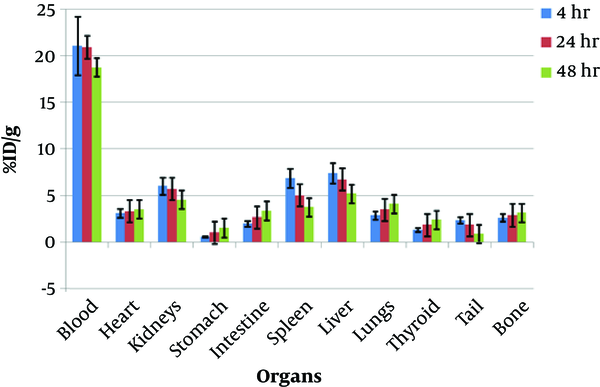 The high percentage of antibody in the blood circulation compared to other organs from 4 to 48 hours post injection indicates the high target/non-target ratio. The 131I decays by beta (0.61 Mev) and gamma (360 Kev). As its half-life (8 days) is similar to the half-life of anti-mouse antibody in human, it is an appropriate radionuclide for RIT. Other advantages of 131I include its easy accessibility, low cost, and known chemistry (13). Comparing 131I and 177Lu radionuclides (9), every 1 mg of the antibody in the chloramine-T method tolerates only 5 mCi of 131I (radiolabeling efficiency of 86%). At higher activities of 131I, we observed decomposition of antibody, whereas in radiolabeling with 177Lu, every 300 mg of antibody was radiolabeled with 6 mCi (radiolabeling efficiency of 92%) (13). 177Lu-Rituximab was more stable (82% up to 48 hours) but only 70% of 131I-Rituximab after 24 hours at 4°C was stable (13). Biodistribution was similar in two methods. 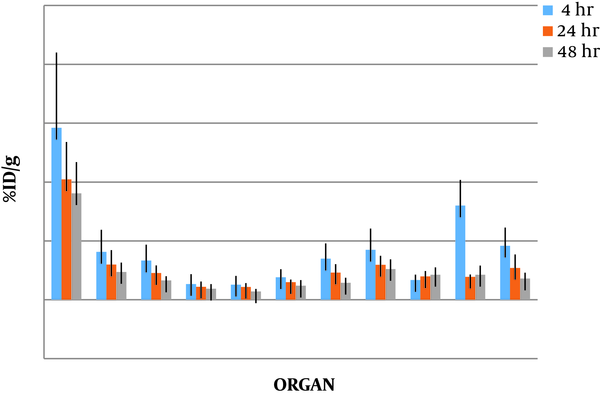 The stability and retention of radiopharmaceuticals in blood pool of normal mice is a positive factor. The result of cell conjugation and examining The immunoreactivity was 58% ± 3% in 131I-Rituximab by chloramine-T method, and 85% ± 3% in 177Lu-Rituximab which indicats that an acceptable percentage of the antibody shows resistance against radiolabeling. Based on results, it can be concluded that radiolabeling with 177LuCl3 has a higher efficiency compared to Na131I, and the resulting radiopharmaceutical has higher stability and immunoreactivity. Biodistribution results were acceptable in the case of both compounds. We thank our colleagues in Radiation Application Research School and Nuclear Sciences and Technology Research Institute that greatly assisted this research. Conflict of Interest: The authors declare that there is no conflict of interests in the current research. Funding/Support: This work was supported by Nuclear Sciences and Technology Research Institute. 1. Kowalsky RJ, Falen SW. Radiopharmaceutical in nuclear pharmacy and nuclear medicine. Washingtone DC: The American Pharmacists Association; 2004. 2. Rasaneh S, Rajabi H, Babaei MH, Daha FJ, Salouti M. Radiolabeling of trastuzumab with 177Lu via DOTA, a new radiopharmaceutical for radioimmunotherapy of breast cancer. Nucl Med Biol. 2009;36(4):363-9. doi: 10.1016/j.nucmedbio.2009.01.015. [PubMed: 19423003]. 3. Hernandez MC, Knox SJ. Radiobiology of radioimmunotherapy: Targeting CD20 B-cell antigen in non-Hodgkin's lymphoma. Int J Radiat Oncol Biol Phys. 2004;59(5):1274-87. doi: 10.1016/j.ijrobp.2004.02.065. [PubMed: 15275710]. 4. Vose JM. Bexxar: Novel radioimmunotherapy for the treatment of low-grade and transformed low-grade non-Hodgkin's lymphoma. Oncologist. 2004;9(2):160-72. doi: 10.1634/theoncologist.9-2-160. [PubMed: 15047920]. 5. Johari Doha F, Rahmani S, Rikhtechi P, Rasaneh S, Sheikholislam Z, Shahhosseini S. Development of DOTA-Rituximab to be labeled with (90)Y for radioimmunotherapy of B-cell non-hodgkin lymphoma. Iran J Pharm Res. 2017;16(2):619-29. [PubMed: 28979315]. [PubMed Central: PMC5603870]. 6. Rasaneh S, Rajabi H, Babaei MH, Johari Doha F. Synthesis and biodistribution studiesof 177Lu-trastuzumab as a therapeutic agent in the breast cancer mice model. J Label Compound Radiopharm. 2010;53(9):575-9. doi: 10.1002/jlcr.1780. 7. Yordanov AT, Hens M, Pegram C, Bigner DD, Zalutsky MR. Antitenascin antibody 81C6 armed with 177Lu: In vivo comparison of macrocyclic and acyclic ligands. Nucl Med Biol. 2007;34(2):173-83. doi: 10.1016/j.nucmedbio.2006.11.003. [PubMed: 17307125]. 8. Brady ED, Chong HS, Milenic DE, Brechbiel MW. Development of a spectroscopic assay for bifunctional ligand-protein conjugates based on copper. Nucl Med Biol. 2004;31(6):795-802. doi: 10.1016/j.nucmedbio.2004.04.004. [PubMed: 15246371]. 9. Lowry OH, Rosebrough NJ, Farr AL, Randall RJ. Protein measurement with the Folin phenol reagent. J Biol Chem. 1951;193(1):265-75. [PubMed: 14907713]. 10. Rasaneh S, Rajabi H, Hossein Babaei M, Johari Daha F. Toxicity of trastuzumab labeled 177Lu on MCF7 and SKBr3 cell lines. Appl Radiat Isot. 2010;68(10):1964-6. doi: 10.1016/j.apradiso.2010.05.004. [PubMed: 20537546]. 11. Forrer F, Chen J, Fani M, Powell P, Lohri A, Muller-Brand J, et al. In vitro characterization of (177)Lu-radiolabelled chimeric anti-CD20 monoclonal antibody and a preliminary dosimetry study. Eur J Nucl Med Mol Imaging. 2009;36(9):1443-52. doi: 10.1007/s00259-009-1120-2. [PubMed: 19350237]. 12. Lindmo T, Boven E, Cuttitta F, Fedorko J, Bunn PJ. Determination of the immunoreactive fraction of radiolabeled monoclonal antibodies by linear extrapolation to binding at infinite antigen excess. J Immunol Methods. 1984;72(1):77-89. doi: 10.1016/0022-1759(84)90435-6. [PubMed: 6086763]. 13. Johari Daha F, Rasaneh S, Zoghi M, Niazi A. [Preparation, quality control, and immunoreactivity study of 131I-Rituximab by Chloramine-T]. J Sci. 2013;23:5-12. Persian. 14. Rasaneh S, Dadras MR. The potential of SOCTA as a chelator for radiolabeling of trastuzumab with 99mTc. J Radioanalyt Nucl Chem. 2015;307(2):1353-7. doi: 10.1007/s10967-015-4314-z. 15. Ali SA, Warren SD, Richter KY, Badger CC, Eary JF, Press OW, et al. Improving the tumor retention of radioiodinated antibody: Aryl carbohydrate adducts. Cancer Res. 1990;50(3 Suppl):783s-8s. [PubMed: 2297724].